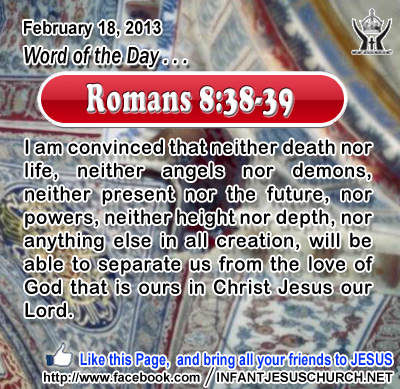 Romans 8:38-39: I am convinced that neither death nor life, neither angels nor demons, neither present nor the future, nor powers, neither height nor depth, nor anything else in all creation, will be able to separate us from the love of God that is ours in Christ Jesus our Lord. Heavenly Father, thank you for loving us. Thank you for giving us the promise that nothing can separate us from your love. Make us more aware of your accompanying presence in our life. We pray this in Infant Jesus name. Amen. 31"When the Son of man comes in his glory, and all the angels with him, then he will sit on his glorious throne. 32Before him will be gathered all the nations, and he will separate them one from another as a shepherd separates the sheep from the goats, 33and he will place the sheep at his right hand, but the goats at the left. 34Then the King will say to those at his right hand, `Come, O blessed of my Father, inherit the kingdom prepared for you from the foundation of the world; 35for I was hungry and you gave me food, I was thirsty and you gave me drink, I was a stranger and you welcomed me, 36I was naked and you clothed me, I was sick and you visited me, I was in prison and you came to me.' 37Then the righteous will answer him, `Lord, when did we see you hungry and feed you, or thirsty and give you drink? 38And when did we see you a stranger and welcome you, or naked and clothe you? 39And when did we see you sick or in prison and visit you?' 40And the King will answer them, `Truly, I say to you, as you did it to one of the least of these my brethren, you did it to me.' 41Then he will say to those at his left hand, `Depart from me, you cursed, into the eternal fire prepared for the devil and his angels; 42for I was hungry and you gave me no food, I was thirsty and you gave me no drink, 43I was a stranger and you did not welcome me, naked and you did not clothe me, sick and in prison and you did not visit me.' 44Then they also will answer, `Lord, when did we see you hungry or thirsty or a stranger or naked or sick or in prison, and did not minister to you?' 45Then he will answer them, `Truly, I say to you, as you did it not to one of the least of these, you did it not to me.' 46 And they will go away into eternal punishment, but the righteous into eternal life." The scriptures tell us with the choice between two kingdoms – the kingdom of light and the kingdom of darkness. The option is ours. Which kingdom do we serve? God's kingdom lasts forever since it is built on the foundation of God's love and justice. To agree Jesus as Lord and King is to enter a kingdom that will last eternally where righteousness, love, truth, and peace dwell. Is our life submitted to the Lordship of Jesus? Loving Infant Jesus, you are our Lord and King and there is no other. May your love rule in our heart that we may think and act with charity towards all.